I'm back. Sorry I've been out of the fray for a while. I'm here now and that is what counts. I will now finally get to my overly hyped Young X-men review. I want to review this series in a semi-different way. 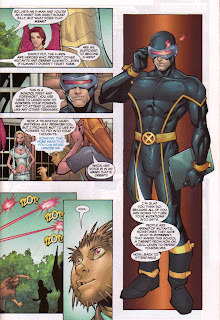 I want to rate it head to head against the book it more or less sprung out of, New X-men. New X-men is a special comic for me, I intend to talk about this more in depth in the future, but New X-men got me into buying comics weekly and creating an actual pull list. For that it obviously has a special place in my heart. As of right now Young X-men doesn't hold that same high esteem, and is basically just a book I'm picking up(I don't expect to be top of the read pile material). First off the cover is simply okay. I'm a fan of #1 covers, with like giant ones on it and really dynamic posing. This cover is really mellow all the kids look kind of sleepy and bored not a great way to start off. Inside the book however is everything a first issue should be. Issue one is introductory and depicts the tone of the issue right off the bat. 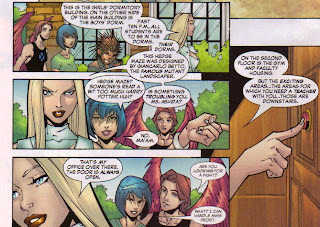 We get a freshly built Xavier's school for the first couple of pages, with Cyclops and the White Queen giving new students a tour. It's neat to see the powers of the X-men through the kids eyes as there is a sense of weirdness and oddity that isn't found very often in most current X-books. We then meet Noriko working at a coffee shop she's cute, confident, and has her own Cyclops like dependence on these bulky cumbersome energy gauntlets. She super speeds her way to campus to join Scott and Emma's tour. She makes all sorts of snarky comments to Miss Frost, which I Find totally endearing and sets her up as girl with a bit of an attitude. We are then introduced to David Alleyne a kid from chicago who appears seemingly ordinary. Noriko and David talk explaining some backstory about the two and giving them a chance to flirt a little, and allow David to show off his mental powers (he can learn all the skills of people around him). We then get introduced to Sofia a pretty Venezuelan girl who can control the wind. She's hanging out with Laurie and Josh who can send out mind control pheromones and heal respectively. The kids talk about really normal teenage stuff basketball, family, playing basketball after dinner, and how there powers factor into there everyday lives. The kids we've met take a quick trip to the danger room to pick up a piece of Noriko's gauntlet she lost which makes her power unstable. Their covert mission to the danger room, doesn't go as planned of course and a sentinel program is turned on. The kids make it out okay and have the feeling that maybe they shouldn't get to attached because the teachers might split them up and we get a to be continued. All in all a good issue. The art is strong, consistent, and generally meets the tone of the series perfectly. The characters show room to grow and have a great teen soap opera type of feeling ala 90210, Dawson's Creek, or Smallville. The covers are great despite the lame looking line up, the art is cool and the overall lay out is smooth and draws you in. 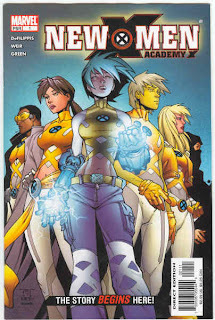 We start off with the young X-men in the midst of a battle with a cyborg. The kids flay off his skin and attempt witty fight banter. Their witty fight banter is so great lines like ""Wolverine" was taken" leave me cold. We are then introduced to blindfold who was seeing the whole scene that will occur in the future. 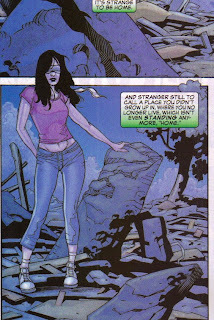 She leaves me the same way she's not as interesting as Noriko and her powers seem to passive and not strong enough of a visual to be the audience's identification character. We are then introduced to Wolf Cub whose calling people bub and doing his best Wolverine impression. He seems really out of character based on the few times we had seen him in New X-men as like an auxiliary character. Also, I hate how every X-team needs like a Wolf-man like character. I find it annoying and it feels like they are selling me the same dynamics in every comic. Scott stops Wolf Cub before he kills an ex-mutant and invites him to a new team of X-men. We then are moved to Afghanistan where some stereotypical muslim terrorists are threatening peaceful villagers before they are busted up by Sooraya Qadir aka Dust. Sooraya is really a cool character and I Have great fondness for her. However, her posing is straight up weak. Paquette likes to pose women with this weird one hand behind the back talking staring at the reader which is strange and annoying. He does this like three times in the issues and they are on two consecutive pages. 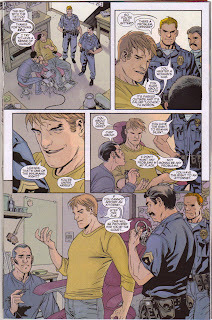 We then arrive in a California tattoo shop where some loser is getting a tattoo cops come in to arrest him for theft and this a-hole mutant exposes them to bio-hazard radiation with his tattoo before he's arrested and busted out of prison by Cyclops. This tattoo guy is totally lame to me he seems like such a villain and a poser I can't imagine how Guggenheim is going to endear him to me. I wish he was a straight up villain. We're then taken to Florida where Rocklside and Blindfold are having a cup of joe at a coffee shop very matter of factly. 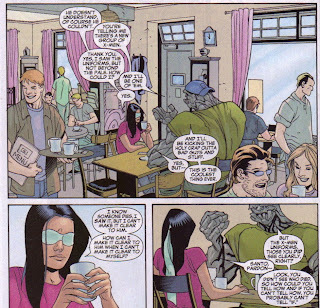 No one in the coffee shop seems to mind that there's a girl with no eyes and a giant rock guy drinking coffee, which to me is a wasted opportunity. Scott shows up and invites Rockslide to the team. He says he'll join only if Blindfold does to. Scott much like myself isn't sold on Blind fold but Rockslide is adamant. Scott randomly blasts Rockslide through the coffee shop window to which none of the coffee shop patrons seem to care or notice. We then finally arrive at the rubbles of Xavier's school. Scott gives a stupid we're warriors and tough speech as the team stands around and tries to look cool in their first mission debriefing. Where, shocker of shockers the old New Mutants are now the Brotherhood of evil mutants and must be stopped. All in all the issue is very weak. The formula of having a guy go around and invite people to to a team is as lame as Stan Lee thought it was when he created the Avenger's and said that super teams should be created through fate and necessity, not just one dude repetitively saying we need you to join us. The art is okay, I don't think Paquette is suited to dialogue and giving character's performances. I also find the way he draws Wolf Cub to be inconsistent and ugly. The dialogue is clunky and the pacing is to slow and chopped up.